Currently in the headlines for its use by both sides in the conflict in eastern Ukraine, the Grad BM-21 multiple launch rocket system has a history that goes back all the way to the early 1960s, when it succeeded the legendary Katyusha rocket battery. The Grad first proved its worth in a border conflict with China back in 1969. If pressed to name a war-changing artillery system, a good bet could be the Grad BM-21 multiple launch rocket system. Amid the chaos in the Middle East and civil war in Ukraine, the Grad (‘Hail’) and its fearsome mode of fire now features regularly in TV news reports. Like a loaded plumber’s truck, the mobile system bears 40 neatly stacked firing tubes behind the cab. But it is more often shown firing than driving, since the visual effect of several of these units firing is awe-inspiring. Within 20 seconds the MB-21 releases all 40 of its 145-lb projectiles into the sky. Racing faster than the eye can track them, the 122 mm rockets travel between three and 13 miles, raining destruction, debris and panic over an area of 14 square hectares. The explosive effect equals that of 152 mm artillery system shells, while dispersing even more fragments. Crewed by three soldiers, the BM-21 was originally conceived to destroy concentrations of soldiers and equipment in a major war. But because of its mobility, the Grad multiple launch rocket system (MLRS) has a broad kill zone, can be quickly readied to fire and immediately withdrawn, making it also well suited to partisan warfare. In regular army usage the BM-21 has corresponding iron sights and can be operated accurately using a spotter. But as it saw action in local conflicts around the globe, it was increasingly used to launch fast and indiscriminate barrages towards an enemy, with a high risk of collateral damage. As was the tradition in Soviet and Russian multiple rocket launch systems, the Grad took its name from dramatic weather phenomena (See also the Uragan/Hurricane, and Smerch/Tornado systems). It was introduced into service 1963, effectively replacing the legendary BM-13 Katyusha, the scourge of German forces during World War II. By the start of the 1960s, the Soviet military had decided that the Katyusha’s 6.5-mile range and 16 firing tubes were no longer up to the task. The Tula designers of the new system dropped the use of turbo-jet rockets, which had lateral jet nozzles to spin the projectile in flight to boost accuracy, and opted instead for folding stabilizers. By also choosing a tube-type launch rail, they managed to fuse the best and seemingly incompatible elements of other MRLS in service. The BM-21 was issued to numerous battalions of motorized infantry and tank divisions. Before long, it was also taken up enthusiastically by armies around the world. In total, more than 11,000 of the vehicle-based systems in all of its modifications were built since 1964. Modified Grad systems have been issued to diverse fighting units, from marines to guerrilla forces. In the mid-1960s, a lightweight Grad-P rocket system was even developed at the request of the Vietnamese. The man-portable weapon comprised a knapsack carry system and could be used in mountainous terrain that was inaccessible to vehicle-borne artillery. The first Grad salvos fired in anger occurred on the Russian-Chinese border in 1969, when Chinese troops seized Damansky Island on the Ussuri River. Under heavy pressure from regular Chinese Army units, Soviet border guards were forced to retreat. Since no further orders came from Moscow, the commander of the Far Eastern Military District, Lt. Gen. Oleg Losik, ordered the use of the still-classified BM-21, 60 units of which had just been received. These supplemented fire from an artillery regiment and several mortar batteries, the combined barrage extending 13 miles into Chinese territory. Enemy forces encroaching on the border sustained heavy damage, and their reserves and supplies were destroyed. When Soviet troops reoccupied the island, its entire 1,000-yard-square surface seemed scorched. The soldiers could barely believe that this was the result of artillery fire, and there were a few resultant rumours of use of chemical weapons. After the BM-21 was declassified it was exported to many countries and played a decisive role in shaping the history of some. In 1975, Angolan and Cuban forces rolled out Grad systems in the Congo to halt the advance of Zaire and South African army units on the Angolan capital, Luanda. The country was thus able to declare independence from Portugal as planned on November 11, 1975. 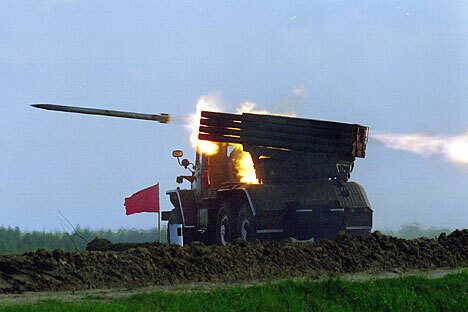 The BM-21 was also used in Afghanistan, often to bombard mujahedin positions in elevated areas. Grad also made its mark in Operation Highway in 1987, helping to annihilate large numbers of enemy and free the route to the south-eastern province of Khost, which had been cut off from the rest of the country. Today, the BM-21 is in service in more than 50 countries around the world. In Russia it is gradually being replaced with the Grad-1, Uragan and Smerch systems. But despite their superior firepower, they are way behind their older brother in terms of combat experience and notoriety.